Many communities in the U.S. West depend on such sources for drinking water. Photo by Kara DiFrancesco. In 2002, a catastrophic wildfire that burned 138,000 acres of forest made Denver’s drinking water supply run black with ash and soil. Cleanup of infrastructure damage, debris and erosion cost more than $25 million, while the fire-ravaged landscape caused increased flooding that wreaked havoc on water infrastructure and roads for years. This catastrophe pushed Colorado’s biggest city to examine new ways to protect its drinking water, looking beyond the water utility and into the forested watersheds where the water supply originates. To lessen wildfire risks, Denver Water and the U.S. Forest Service (USFS) started a watershed investment program to improve management of source water forests, together dedicating a total of $32 million to forest restoration over five years. Starting in 2011, Denver Water has invested in forest restoration and improved forest management to reduce the risk of wildfires, and USFS shares costs and implements those restoration activities. Four other Colorado cities -- Aurora, Colorado Springs, Pueblo and Fort Collins – saw the partnership’s potential. 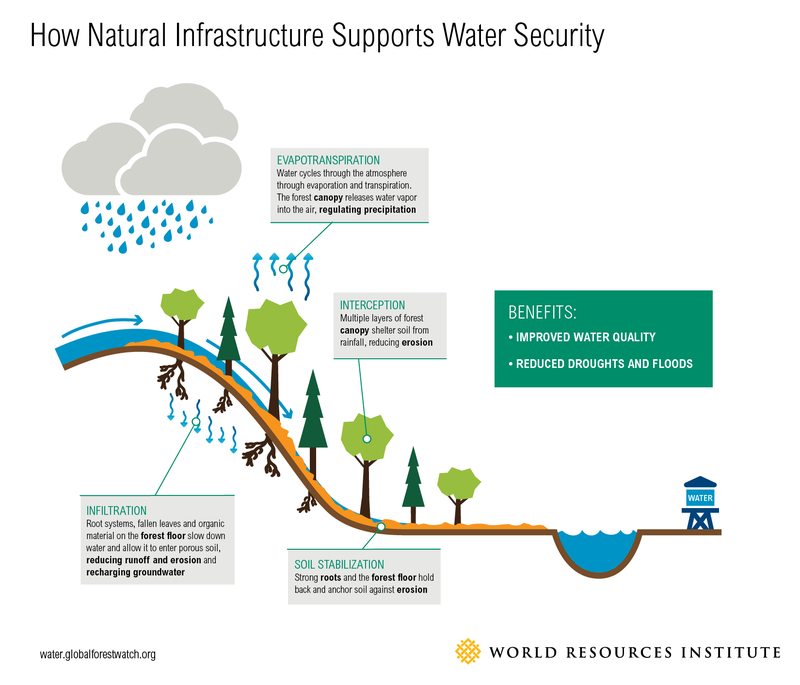 These cities now also invest in watershed protection to safeguard their water infrastructure and supplies and potentially reduce costs of water treatment. By investing in forest protection, these cities’ utilities also help the communities they serve with benefits including recreational opportunities, job creation and carbon sequestration. Colorado is not alone in facing drinking water supply risks from watershed degradation. A 2008 study found that the water supply for over half the municipal water supplies in the United States – serving more than 10,000 cities -- originates in forested watersheds. These areas are increasingly at risk due to deforestation, poor forest management, pest infestations and climate change. Despite these risks, only an estimated 40 or 50 watershed investment programs focused on improving drinking water through forest management exist. Why are so few communities making this sensible investment to protect their drinking water? Many have been unable to build upon others’ experience to design programs that bring together multiple stakeholders, attract investors and generate results. 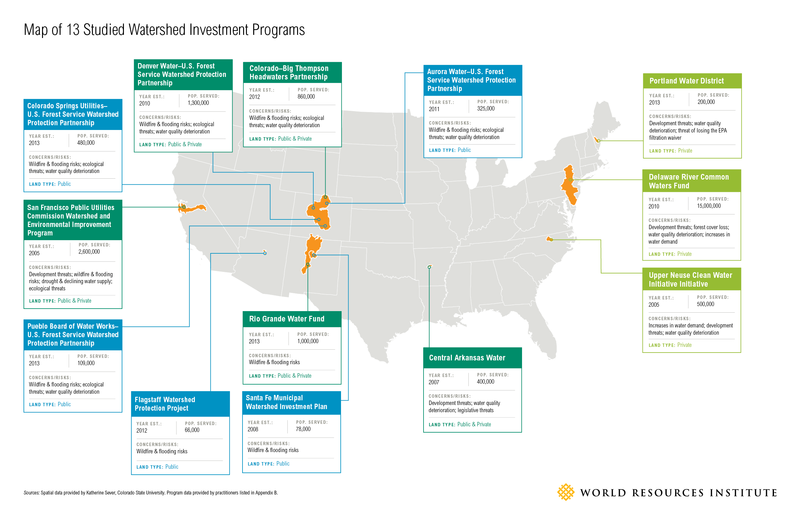 To help change that, WRI conducted a three-year in-depth comparative analysis of 13 U.S. watershed investment programs. The goal was to gather intelligence from existing programs, along with tangible examples to be applied to different localities, as a one-stop resource on this critical topic. Already, funders are starting to use these lessons to help them determine whether programs are ready for investment. The U.S. EPA and U.S. Endowment for Forestry and Communities’ Healthy Watersheds Consortium Grant Program adopted these lessons as selection criteria in a seed-funding grant program for watershed investment programs. Grant applicants are now judged and selected based on, among other factors, how well they address 10 factors for success that WRI’s study identified. Because EPA is influential in national land and water management, its adoption of these success factors as grant-making selection criteria sets a new standard for evaluating watershed investment programs’ readiness for investment. Other seed funders are already indicating that they will use these success factors to guide watershed investments, and that trend is likely to grow over the coming year. This report can be used to guide the planning, implementation and financing of watershed investment programs nationwide. In the process, they can save lives, human health, infrastructure costs and the drinking water that communities need to sustain their citizens and businesses. For a broader discussion on protecting drinking water, tune into the WRI Podcast, where WRI Vice President for Communications Lawrence MacDonald sits down with Todd Gartner, a WRI Senior Associate with the Water team and co-author of a new paper on watershed protection, and Jasmine Qin, a Research Analyst and driving force behind Global Forest Watch – Water. Together, Todd and Jasmine lay out the importance of natural infrastructure like forests and wetlands in preserving and protecting the watersheds that provide our communities with water. For more information, see the full WRI report here and learn about presentations of its findings in Minneapolis and Jacksonville, Florida.